When you open your closet, is it so scary you want to shut it and just wear what you wore yesterday? 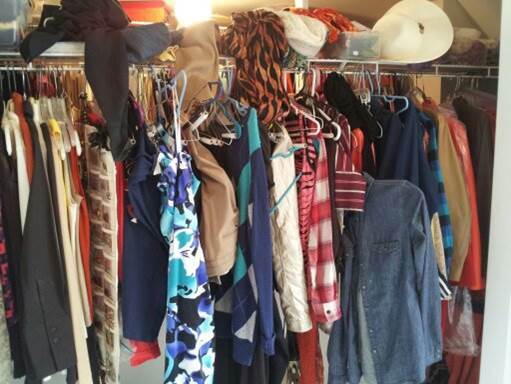 Is your messy closet blocking you from creatively expressing your best self through clothes? 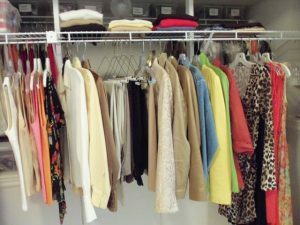 Here are some tips for making sense of your closet so you can be enjoying the daily pleasure of getting dressed. Senseless: You are staring at a bunch of clothes with sales tags still attached to them. Good Sense: Gather up the items that you’ve never worn and try them on. Now tell the truth – would you buy them again? If the answer is no and they’re still pretty current, take them to a consignment store and get back part of your investment or give them away. If you’re still attracted to them, take a few minutes to create some outfits and wear them as soon as possible. You may have just forgotten about the gems you have in there! Senseless: Clothes you won’t wear for another six months are crowding out clothes you should be wearing right now. Good Sense: Remove the out-of-season clothing. You don’t need to visually edit out the halter dresses and capris if you’re in the season of cashmere sweaters and wool trousers. Focus on the season you’re in and store everything else out of sight. Senseless: Your clothes are hanging on wire hangers or mismatched plastic, wood and padded hangers in multiple colors. 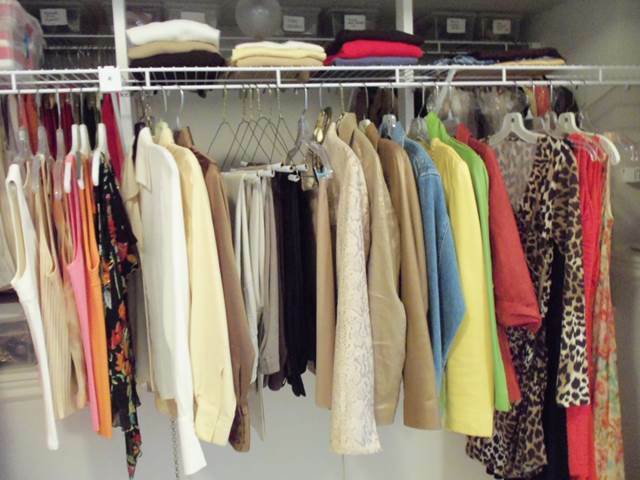 Good Sense: Your closet deserves as much order as you can give it. Everything looks better when hung on hangers that are the same color and style. Please, no wire hangers! Hang all the hangers in the same direction, and that goes for your clothes too. Senseless: On laundry day, you hang your clean clothes wherever you can find a gap in your closet. Good Sense: Organize your closet in a way that makes sense to you. You can hang clothes by color from light to dark or hang them by item – pants, blouses, skirts, etc. Then on laundry day, you put your clothes back into the section you’ve created for them. If you open your closet and see order, getting dressed will be a daily pleasure. Good Sense: Focus on the now. Remove all the “If only” clothing and either park them in a different closet, or have them altered, cleaned or repaired. It’s easier to relax and be yourself when those aspiration clothes are out of your closet. Senseless: You are hanging onto your “fat” clothes long after you’ve reached your goal weight. Good Sense: Accept your new frame by removing all the ill-fitting clothing. You aren’t wearing those items anyway. If you’re hesitant about embracing the reality of your new size, then at least pull out the oversized clothing and store them away. Senseless: You’re unhappy when you open up your closet because you know you’re not maximizing what you have. You’re just not sure how to make it all work. Good Sense: Getting help! Making the act of getting dressed one that you can derive pleasure from on a daily basis is worth investing in . . . pronto!